October 20 is World Osteoporosis Day. World Osteoporosis Day is a wonderful opportunity for you to learn more about your bone health. Osteoporosis causes bones to become weak and fragile, which results in bones breaking more easily. Wrist, hip and spine fractures are more commonly related to osteoporosis than any other bone fracture. According to the National Osteoporosis Foundation, around 10 million Americans have osteoporosis. 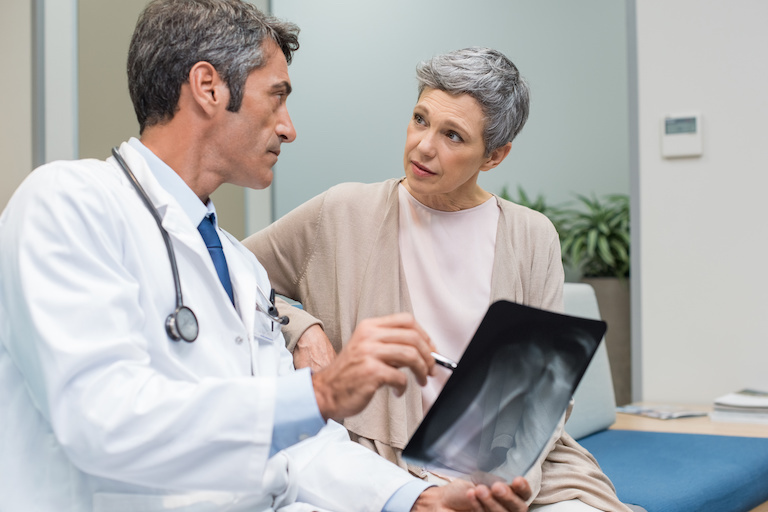 According to the National Osteoporosis Foundation, one in three women and one in five men who are 50 years of age and older will suffer from an osteoporotic fracture. Women have a greater risk of breaking a bone due to osteoporosis than suffering a heart attack, a stroke or breast cancer. Osteoporosis is considered the “silent disease” because a person cannot feel his or her bones weakening. Unfortunately, the disease may not be detected until after a bone breaks. Although osteoporosis is common among adults 50 years and older, five common steps can improve bone health. Establish a consistent exercise routine to build muscle and bone strength. Avoid negative lifestyle habits, including smoking and excessive drinking. Maintain a healthy diet that is abundant in protein, calcium and vitamin D.
Seek a physician’s advice to detect weakening bone density. Take proper precautions to protect against future bone deterioration, like taking osteoporosis medication. Incorporating these five common steps into daily life may seem daunting, but it is simpler than it appears. Perform exercises that may be done in an everyday routine, like walking to the grocery store, hiking with a pet or playing catch. Finding meals that include protein, calcium and vitamin D is easy. Cook a meal that includes healthy ingredients you love. For example, salmon, sweet potatoes and leafy greens are good food sources for bone health. If one of your parents has broken a wrist, hip or spine, you may be more at risk of developing osteoporosis. Ask family members if osteoporosis can be traced back in your ancestry. When you visit your doctor, tell him or her that your family health history includes cases of osteoporosis. Scheduling regular health checkups with your doctor will diminish apprehensions you have. Whether you have osteoporosis or are unsure if you may have it, supporting the cause against this disease is rewarding. You may donate money to an osteoporosis organization, wear an osteoporosis awareness ribbon or provide emotional support to a family member or friend who may have the disease. Your bones are important. They provide the framework for your body by protecting vital organs and producing blood that the rest of your body uses. Bones play an integral role in our everyday lives, and it is never too late to seek guidance regarding your bone health.